Where is Bangladesh on the world map? Comparatively small country of Asia, Bangladesh is located in far south Asia bordered with India in the west and north and in the south-east shares small boundary with Myanmar (Burma). However, in the south Bay of Bengal limits its southern boundary. The literal meaning of Bangladesh is �nation of Bengali people.� Hence, mostly Bengali people lives here and the official language is also Bengali. 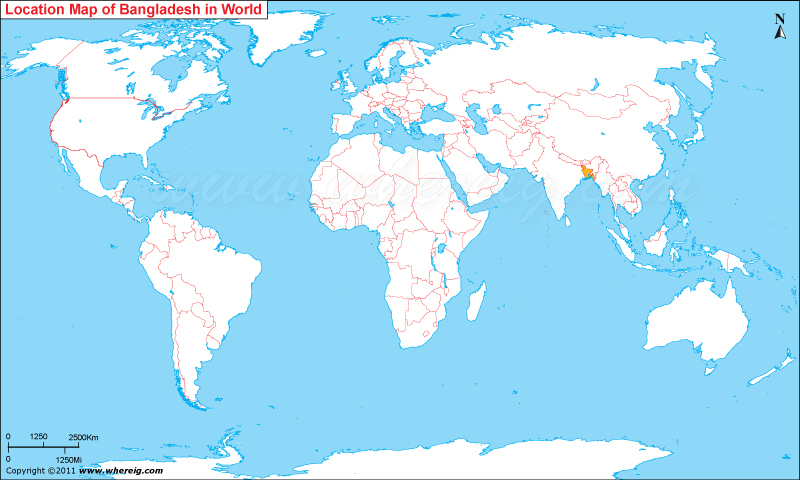 Of course, on the point view of geographical location, Bangladesh is 94th country of the world but in terms of population, it is merely 8th populated country of the world. Geographically, the country bestrides the fertile Ganges-Brahmaputra Delta with characteristic of annual monsoon floods and cyclones. Type of government in Bangladesh is a parliamentary democracy with an elected parliament known as the Jatiyo Sangshad. The country is a member of many supera-national organizations including the Commonwealth of Nations, SAARC, BIMSTEC, the OIC, and the D-8. As per the World Bank report, the country has made significant improvement in human development in terms of literacy, gender parity in schooling and decline of population growth. Nevertheless, Bangladesh has number of other challenges, including prevalent political and bureaucratic corruption, economic competition, overpopulation, widespread poverty, and other natural disaster by ecological vulnerability to climate change. Interestingly, the Sundarbans, the largest mangrove forest in the world which is home of diverse flora and fauna is the significant region in the country. For the tourism in Bangladesh purpose Sundarbans is very important. In the year 1997, the region had been declared endangered. One of the most favorite points of attraction for the tourists is Royal Bengal Tiger. People can make tour of this natural diversified landscape.